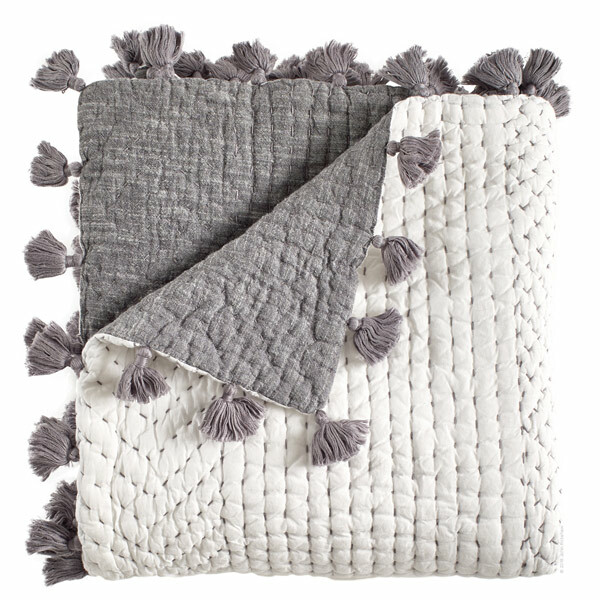 These super fine cotton throws are patiently stitched by hand, each one taking a week to complete. Crafted in thin layers of cotton voile, and a contrasting reverse of cotton chambray, only the superfine fabric brushes against your skin, not the stitches themselves. Just for fun, John Robshaw added pompoms. These super fine cotton throws are patiently stitched by hand, each one taking a week to complete. Crafted in thin layers of cotton voile, and a contrasting reverse of cotton chambray, only the superfine fabric brushes against your skin, not the stitches themselves. Just for fun, John Robshaw added pompoms. Front: 100% cotton Back: 100% cotton slub chambray Several colors Hand stitched Made in India Machine wash cold separately, hang dry.